El Cartel is by far my favourite place for Mexican food in Edinburgh. That's all I really need to open with. If you haven't yet heard of the magnificence of El Cartel you've been living under a rock. If you've heard of it and haven't managed to get yourself a table, now that I understand. El Cartel is absolutely tiny and doesn't take bookings, so it's luck or a lot of hanging around that will get you a table. Your best chance of getting a table is either being super early for dinner or heading there on a weekday. Put your name down on the waiting list and head to Bon Vivant for a drink or two, it's definitely worth the wait. Once you're in there you'll get to enjoy the quality food with pretty decent music to top it off. The food at El Cartel is Mexican street food so they come in fairly small portions. 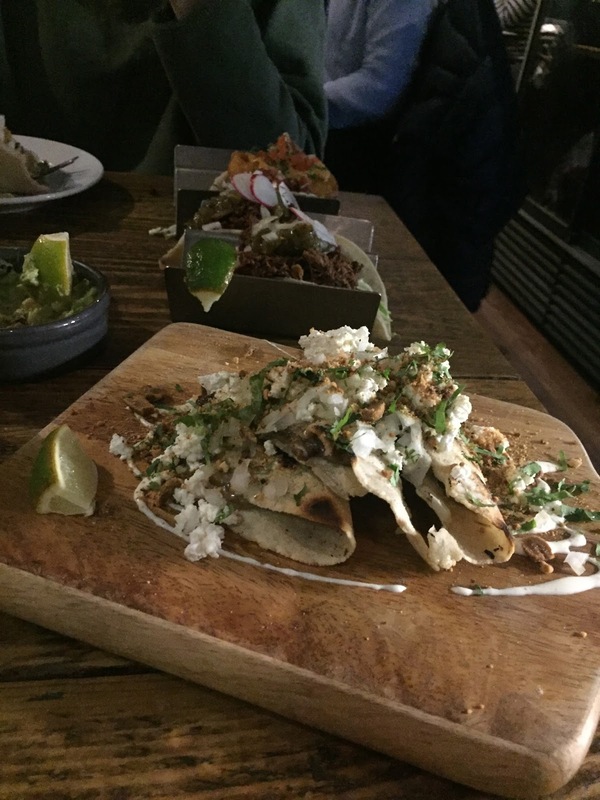 While you are expected to usually order more than one plate of food, I would say the portions at El Cartel are larger than your ordinary tapas. I'd usually recommend ordering 2-3 plates each, which is pretty filling and that's coming from someone who can put away a lot of food (normally when tapas places recommend 2-3 plates I scoff at them and order way more). The last time I went my friends and I ordered so much food that they advised us to stop ordering... That being said we finished it all and it was one of my proudest moments (is that sad...?!). El Cartel definitely takes the crown for best guacamole in Edinburgh (although my friends will attest that my own guac is pretty impressive... El Cartel I challenge you to a duel... just kidding I would lose). Their Guacamole National is topped with cheese, pomegranate and spring onion. The sweetness of the pomegranate is something I'd never have previously associated with guac (I'm not even sure I normally like pomegranate) but it goes perfectly. The guacamole comes with plantain crisps instead of tortilla chips, which again offer just a touch of sweetness. The guacamole is the dish I recommend the most... it really isn't a trip to El Cartel without their famous dip. So what else do I recommend you order? Their frozen margaritas. These are again some of the nicest frozen margaritas in town and come in a variety of flavours that change all the time. I love a good fruity margarita, on my last visit there was a delicious strawberry one on the menu. The menu is split into 'Tacos' and 'Antojitos' and while it's not the biggest menu in the world, it is definitely a case of quality over quantity. The taco fillings are a mix of everyone's favourites such as cod, steak and duck tacos to some pretty unique toppings such as purple sprouting broccoli, shredded ox and plantain. So whether you like to stick to the classics or push the boat out there's a taco for you. For such a small menu there's also a decent amount of veggie options. They change up a couple things on the menu every now and then. On a recent visit I noticed that they no longer serve my favourite quesadillas which were filled with cheese and mushrooms and topped with peanuts. (El Cartel if you read this bring them back!) Instead the quesadillas are now stuffed with chorizo, sweet potato, soft cheese, fennel and salsa verde. Still delicious but I was more of a fan of the mushroom ones. They also serve ribs, wings and jalapeño bombers if tacos and quesadillas aren't your thing. I've yet to try them but I'm keen to next time I'm back in. When friends from outside of Edinburgh ask me where to go for food, El Cartel is one of the first places I recommend. It has a small, quality menu of street food alongside a great vibe and great margaritas. Perfect place for a meal out with your friends (maybe a drunk one... the margaritas are small but boy do they pack a punch). Don't believe me? Check out their menu for yourself here. Great review! I absolutely love it there. Last time I had Blood orange & apricot frozen margarita - amazing! The food is so good!